Brand new in box union scott Steve’s bindings size large Only bolted to a board once but never used! Great bindings! Uk sale only! Item will be shipped following Friday from when auction ends with tracking! Condition: Used, all parts such as screws, ratchets, footbed, heal cup, baseplate are in good working order without any defects other than scratches. Large union bindings, fit a size 9 boot upwards. Great condition, as only used for a weeks holiday. While developing the Ultra, Gigi Rüf and the engineers at Union had one goal: uncompromised board flex and feel. They have had light use over the last 4 seasons, an issue with the original highbacks was made apparent on my last outing and so union just straight up replaced them both. 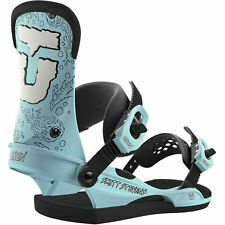 Winter 13 Cobra Dogs Snowboard Bindings L/XL. In the winter Cobra Dogs supports a lot of contests and events such as the Holy Oly Revival and Superpark, traveling around the country serving food and having fun. The bindings are in excellent condition. I have taped riser stand as the rubber covers were not that durable. The rubber only peels off as when splitboarding you are lifting the riser up and down with your pole basket. The Force is consistently the most popular binding in the range and with good reason too. Pretty rad, right?. It's no wonder that the Force is the choice of many pros including Dan Brisse and Kevin Jones! The result is ride that is forgiving where you need flex and responsive where you want direct connectivity. Duraflex CB Nylon, integrated with super cushioned Non-Stick Coated Vaporlite 3.0 Bushings bring the next generation of Union to the forefront.